Playhouse. While the 300 year old Italian home of architect Armin Blasblicher features rustic, vernacular elements like stacked logs, Blasblichler updated the house with whimsical, playful elements. 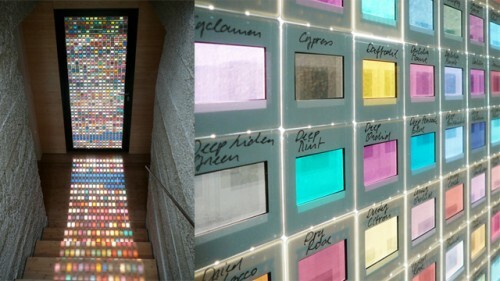 He incorporated doors on ceilings, doors within doors, and a contemporary interpretation of stained glass inspired by Pantone color swatches, as pictured above. More at Gizmodo. Super-giant photo. The Culver Center of the Arts in Riverside, California is exhibiting the world’s largest photograph, created by the world’s largest camera. Lost at E Minor said the camera was fashioned from a converted airplane hangar with a 6mm opening in one its walls. At eleven stories long and three stories high, the resulting landscape photograph needed a 35 minute exposure. Blooming brownfields. Seattle is cleaning up its brownfields in South Lake Union. The district, once home to factories, paper mills, and other industries, fell into decline as businesses moved out. For decades, the sites lay abandoned, tainted with toxic chemicals. The city has issued large-scale cleanups that include removing contaminated soil and building materials. The area is in various phases of redevelopment, with new offices, residences, and shops opening, reported the Wall Street Journal. Un-knotting bikes. Knowhow Shop created a playful tongue-in-cheek bike rack for Roanoke, Virginia in the shape of a large comb, keeping bikes upright and tangle-free. Resting on its side, it is made from mangaris wood and supported by black steel bars that are supposed to resemble hair, posted Gizmodo.